Kaputian was our point of entry to Samal Island from Talicud Island, which are both part of what is commonly knowns as IGACOS, short for the somewhat long Island Garden City of Samal in Davao Del Norte. 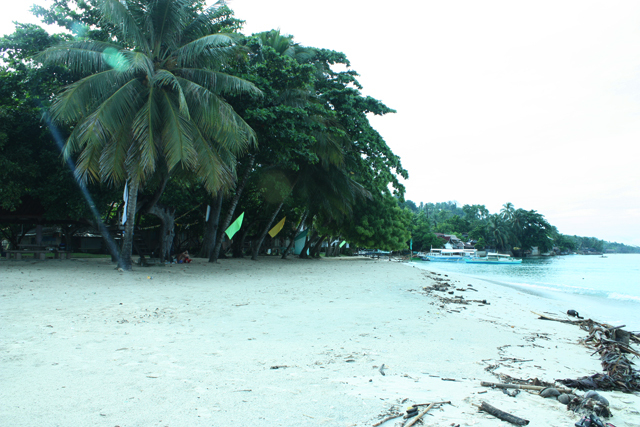 Prior to the trip, we thought that the only way to go to Samal Island from Talicud Island is to go back to Sta. Ana wharf in Davao and then take another boat ride to Samal Island. The habal habal driver who took us to Babusanta and Dayang beach the previous day however said that there are available boats that we could charter to take us to Samal island for P300 only and offered to find a boat for us to rent. We would have taken his offer had we not spoken to one of the workers at Isla Reta later that same day and found out that there are actually passenger boats going to Kaputian from Sta. Cruz wharf. Fare? P20 each only. Sta. 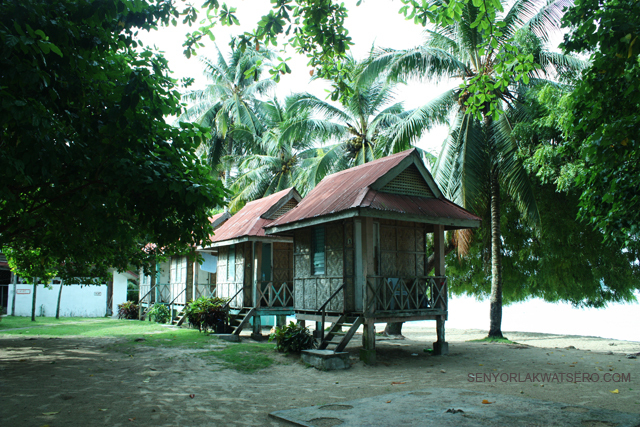 Cruz wharf is just 5 minutes walk away from Isla Reta. It was a smooth and comfortable 15-minute boat ride all the way to Kaputian. After getting of the boat, we followed the other passengers and found ourselves at the main road a few minutes later. 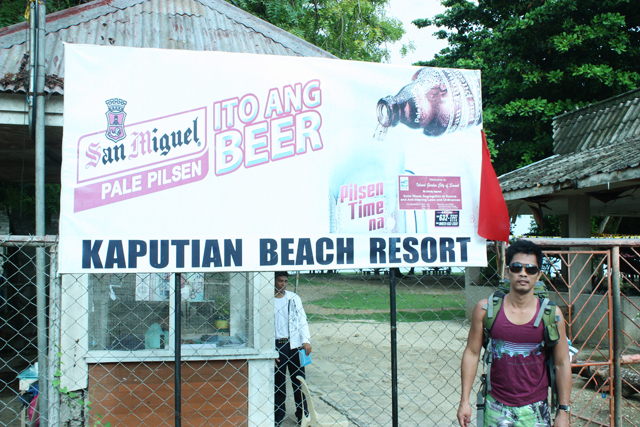 We were about to ask where Kaputian Beach Park Resort is when I saw the park’s signboard not far from where we were. We walked towards the gate and were welcomed by the guard who showed us where to pay the entrance fee. I hurriedly went to the beach afterwards. Having been recommended by a friend who used to live and work in Davao, I was excited to see the beach. It had been said to be a place where one could experience beautiful white sand and clean crystal clear seawater and a great spot to go for those who want to break away from the stressful life of the city. When I reached the beach and got to see it for myself, I got confused though, and wondered whether or not I was on the right spot. I wanted to make sure so I approached one of the women who were busy sweeping some trashes around the open concrete cottages and inquired if there was any other public beach nearby. She said none. So I asked, even after I had already read their signboard, “ Eto na po ba yung Kaputian Beach Resort?” ( Is this Kaputian Beach Resort) She nodded . I thanked her and looked at the surroundings one more time. The sand was indeed white, but what I did not expect was that it is mixed with broken dead corals, stones, dried leaves and twigs along with several decomposing banana trunks. It looked like a typhoon hit the beach just recently. Perhaps it was because it had been raining for the past few weeks. I just hoped that the beach is in better condition during the dry season. The view of Talicud Island from the beach park was ordinary. To describe it as breathtaking was an exaggeration. On the left side, facing the sea, was the wharf. The right side seemed to be a squatters’ area. Except for a few floating leaves, the water was surprisingly clear though, and was great for swimming. With a regular clean up, the beach would surely be much nicer and more inviting. If the beach had been tidier and the leaves and twigs and those banana trunks had been removed from the shore, the resort would have looked better. The beach should be easy to maintain since it is small at approximately no more than 200 meters long and 15 meters wide. 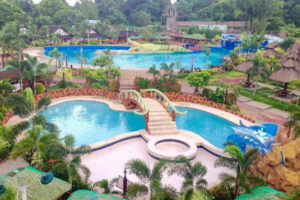 The resort is just walking distance to the bus terminal, and to the public market where a number of sari-sari stores and carinderias (eateries) to eat and buy supplies can be found. They don’t charge a corkage fee. 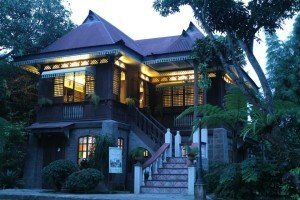 For those who wish to stay overnight, they have aircon rooms and non-aircon rooms available at very affordable prices. For more information on rates and their facilities, please check this LINK. We only spent an hour in the resort. 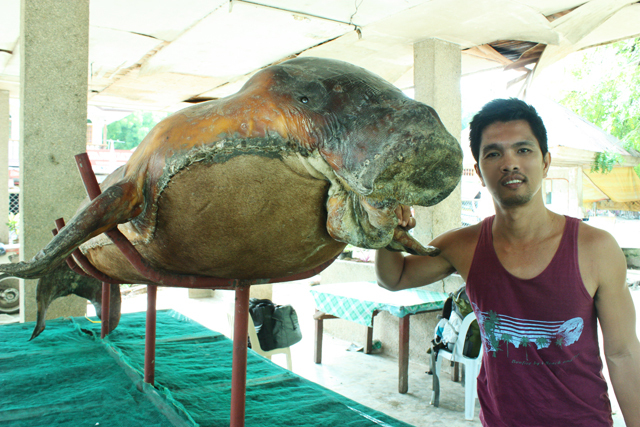 After walking along the beach for a while and taking a few photos , we moved along to get to our next destination, but not until we had a picture with the well-preserved dugong (sea cow,) which was displayed near the beach entrance. The sea cow was found lifeless in the resort’s shore. Quite sad and a big loss especially since they could live up to 70 years, and given their slow rate of reproduction, the dugong is especially vulnerable to extinction. By bus. Go to Magsaysay Park or the IGACOS Ferry Terminal in JP Laurel Street and board the “Island City Express,” a non-aircon bus going to Samal. Just tell the driver or bus conductor you’re going to Kaputian. 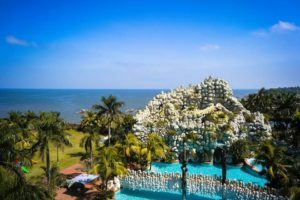 For first time readers, this post is the 3rd of the series of destinations I visited during my trip Davao. You might also like to read, Part 1,Part 2, of this series. Thanks! Nice. 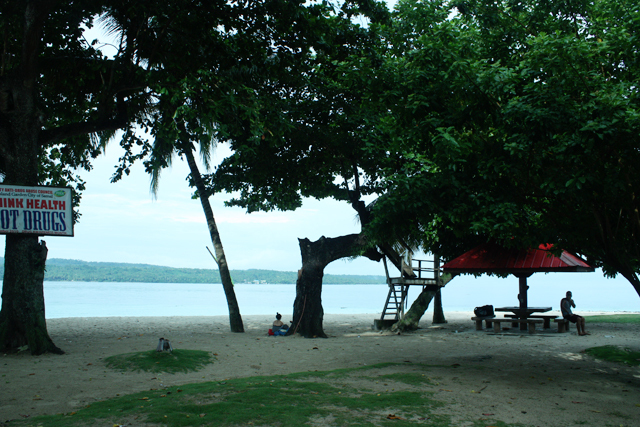 I should go here instead next time I go to Samal. Thanks! for the info, it helped me decide which resort to go in Samal. Very informative blog! I would just like to ask how long it would take to go to Kaputian beach from Mainland davao if we take the Island City Express bus. Also how often (intervals) do buses ply the route from Kinawitnon Wharf to Kaputian wharf vice-versa. Thank you in advance! We are scheduled to go to Davao this coming June and we plan to visit Samal by bus to minimize transportation cost as there are only two of us. do you have a contact no. for kaputian beach? pwd malaman contact # nang resort? may contact number ka po sa kaputian?.. pwde malaman ung contact number po nla ?